Read instructions though before beginning. Blanket in photo is knit with one strand of Red Heart Super Saver in Banana Berry and one of Lion Brand Pound of Love in white. I used a postage scale to weigh the Red Heart Super Saver and started the final garter stitch rows when there was ½ ounce left. That worked out perfectly. If you want a larger blanket cast on in additional increments of 2 stitches. You will need more yarn of course. 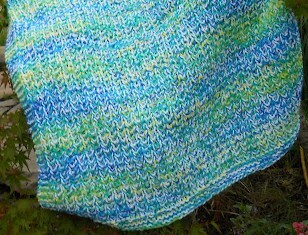 Blanket is worked with two strands through out. Repeat rows 1 and 2 until blanket is 35 (31) inches from cast on edge. this looks so pretty...i am going to print it out..